Cellfood is a nutritional supplement, Cellfood is not a drug. Cellfood, a proprietary ionic formula that contains 78 ionic minerals, 34 enzymes, 17 amino acids, electrolytes and dissolved oxygen and utilizes a unique water-splitting technology. Cellfood provides an unsurpassed oxygen and nutrient delivery system, and is absorbed quickly and efficiently by every cell in the body. Cellfood 's unique structure oxygenates and feeds the cells-cleaning and tuning up the body's systems throughout the day. Cellfood is made from all-natural plant substances, and is yeast-free and gluten-free. All functions of our body are regulated by oxygen. Scientists find out that most diseases and infections are brought on by oxygen starvation at the cellular level. Cellfood provides the highest level of nascent (newly born) oxygen and hydrogen in supplement form to improve our energy, endurance, and natural health. Invented by Everett L. Storey, Cellfood is a proprietary formulation of a super energized colloidal mineral concentrate. Cellfood's Di-base, Di-pole Deuterium Sulfate provides an incredible oxygen source and delivery system to the body at the cellular level. This award winning formula naturally provides the highest level of nascent oxygen and hydrogen in supplement form improving energy, endurance, and natural health. Cellfood has the unique ability to dissociate the water molecule into nascent hydrogen and nascent oxygen. This water "splitting" technology enables the release of hydrogen and oxygen gases simultaneously in a chain reaction that involves one five-hundred thousandths of the available moisture at one time. Water "splitting" is achieved by means of shifting and weakening the bonding electrons (ionic transfers) of the water molecule towards oxygen and away from hydrogen. Cellfood allows the bonds in the electron distribution to be unsymmetrical (polar). The water molecule can then be described as Di-pole, with the oxygen atom acting as a negative pole and the hydrogen acting as a positive pole. 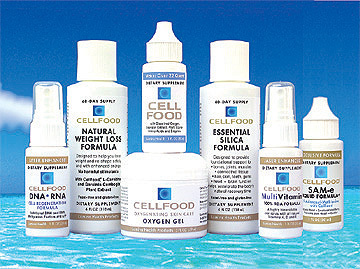 Cellfood is the world's leading high-performance oxygen and hydrogen based health product. For over 40 years, Cellfood has safely provided nutritional benefits, without toxicity.